Christmas and New Year’s Eve are fast approaching and everybody is looking for unique gift ideas. Whether for friends or family – at Vini per tutti you will find perfect Christmas gifts. A wine for special occasions! Excellent with all meat dishes, beef, lamb and hard cheese. A full-bodied red wine with purple shades, smooth flavour and a scent of vanilla aroma. Excellent with red meat dishes, beef and lamb. Goes well also with hard cheese. A blend of Sangiovese, Merlot and Barbera. 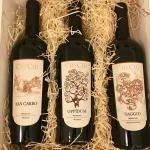 A fresh wine which accompanies well red meat, sauces and salads. 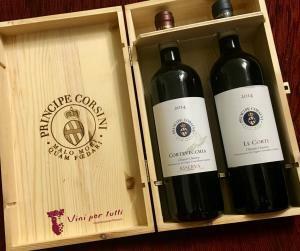 Chianti Classico Riserva Cortevecchia is a smooth and elegant wine. Complex with initial aromas of flowers, fresh and delicious to drink. It has smooth, consistent, fine tannins and a long finish. Intense ruby red in color, the wine has a brilliant and silky profile, almost thirst-quenching with its traces of raspberry, violet, lavender, and forest roses. Ideal with roast pork, mixed boiled meats, wild fowl, grilled white meat, and medium-aged cheeses. A decisive and elegant Sangiovese with a strong Chianti character. It is a very balanced wine that is still evolving, and has great longevity. A well structured white wine, excellent with appetizers, cold-cuts and cheese, fish and poultry. A classic and very expressive award-winning Pinot Grigio! It has a soft, delicate palate that is a nice accompaniment for asparagus, fish and delicate meats. A fresh and fruity full-bodied wine, with hints of tobacco and spicy notes of pepper and minerals. Enjoy it with typical Austrian dishes as well as with fish, seafood and poultry. An Aglianico-based smooth and full-bodied rosato, with notes of wild berry and raspberry. It is ideal with sauced fish and poultry, but also outstanding with Campania mozzarella di bufala and with pizza napoletana. A sparkling rosé wine from Sangiovese grapes, with decisive aromas from wild strawberries, freshly-picked currant, mandarin juice, and notes of wildflowers. Excellent with appetizers, pizza and vegetables. 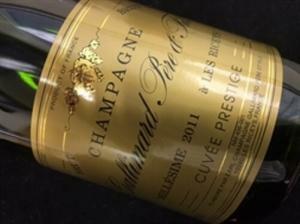 This is the top champagne from Gallimard. Exclusively elaborated with Chardonnay and Pinot Noir, it is perfect for celebrations like New Year’s Eve, very good as aperitif, but also with fish or white meat. Fresh aromas of green apple and pear, with soft and creamy perlage. 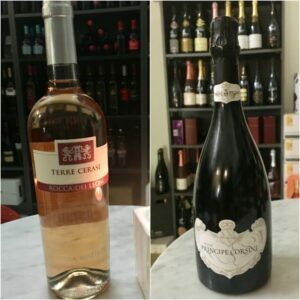 This extra-dry Prosecco is ideal as an aperitif, as well as with delicate and exquisite dishes. This wine has a white and creamy froth, a deep straw-yellow with green shades colour and a thin perlage. Its fresh almond’s flavour is agreeable and soft to the palate. It is ideal for aperitif and fish plates. Time is running out and you still haven’t found the right gift? Don’t worry! Visit our shop at Lerchenfelder Straße 44, 1080 Vienna. 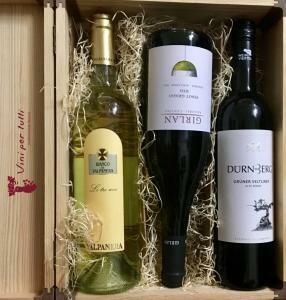 There you can also discover our variety of products and taste our wines… and we guarantee to find you the ideal last-minute gift! 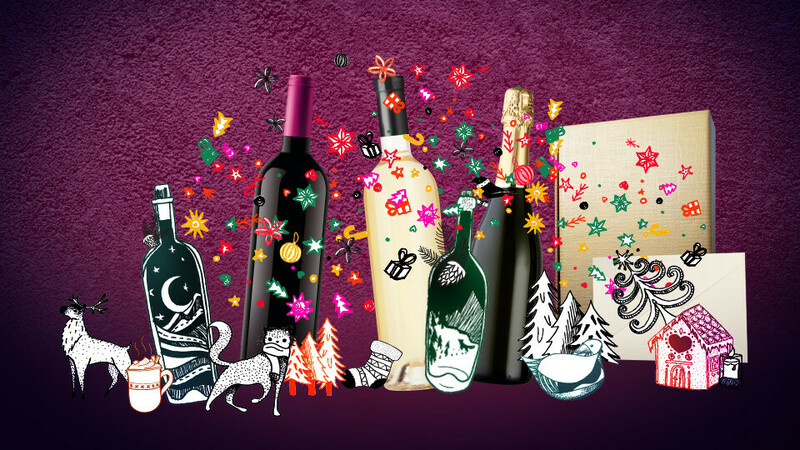 Vini per tutti wishes you Happy Holidays!